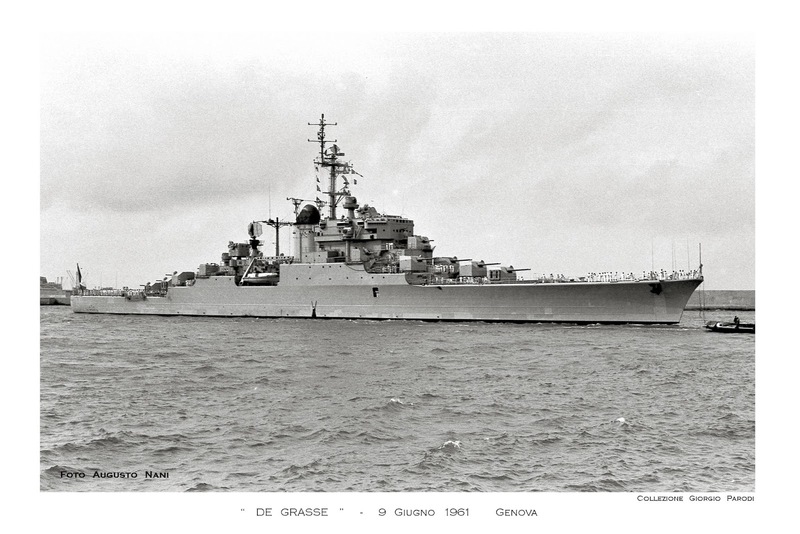 The De Grasse was designed in the late 1930s, as the lead ship of a series of three cruisers a little heavier than the preceding La Galissonnière-class cruisers, notably with an improved anti-aircraft equipment and speed. The other two ships Chateaurenault and Guichen were cancelled. 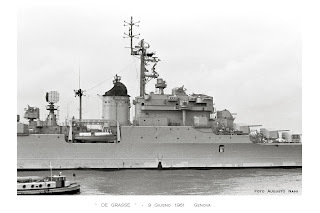 The De Grasse was laid down at the Arsenal de Lorient shipyard in Lorient in November 1938. 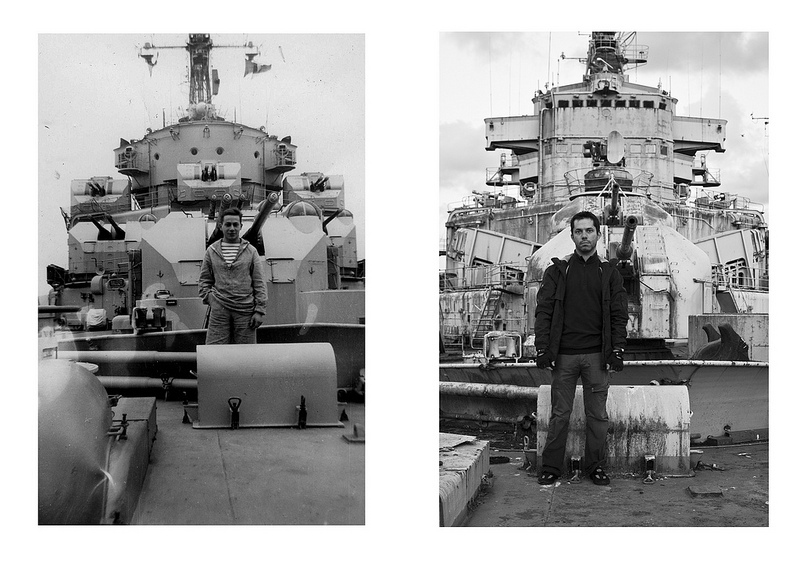 Work on the unfinished ship stopped following the German conquest of France in May 1940. In 1942, the Kriegsmarine considered several proposals to convert the cruiser into an auxiliary aircraft carrier. The final proposal was completed by August 1942, but work on the conversion did not last long. By February 1943, the project had been abandoned, for several reasons. 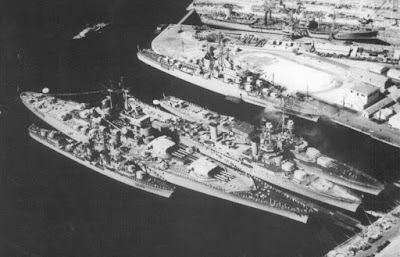 The shipyard suffered from a shortage of labor and materials, and the design staff had significant concerns over the arrangement of the engine system. The Allies also posed a serious threat, as Lorient was well within the range of Allied bombers. The ship was eventually retaken by the French Navy after the end of the war, and launched in 1946. The construction was halted again between 1946 and 1951, when she was towed to the Brest Navy yard to be completed, to a significantly modified design as an anti-aircraft cruiser with eight twin 127mm guns (18rds/min rate of fire) and ten twin 57mm guns (120rds/min). The layout of the armament was intended to optimise all-round coverage for the anti-aircraft battery at all angles of elevation, with up to eight (8) aerial targets able to be engaged simultaneously. 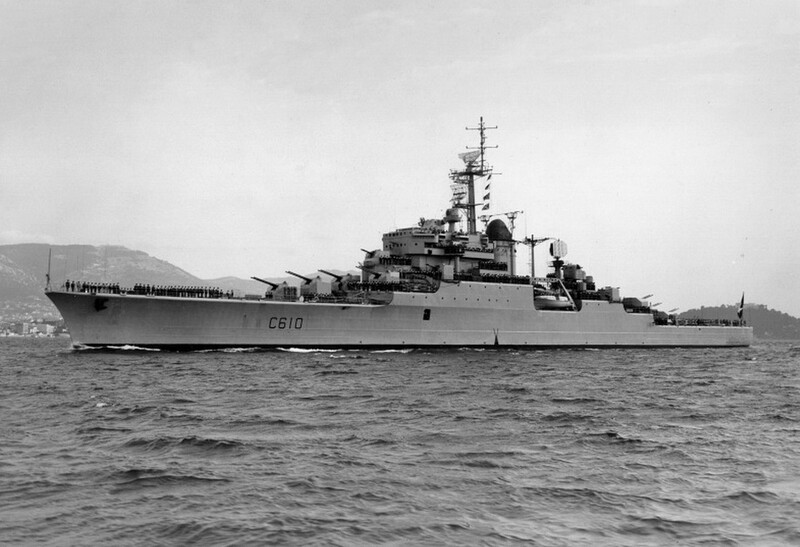 The trials began on 17 August 1954 and she was commissioned on 10 September 1956. 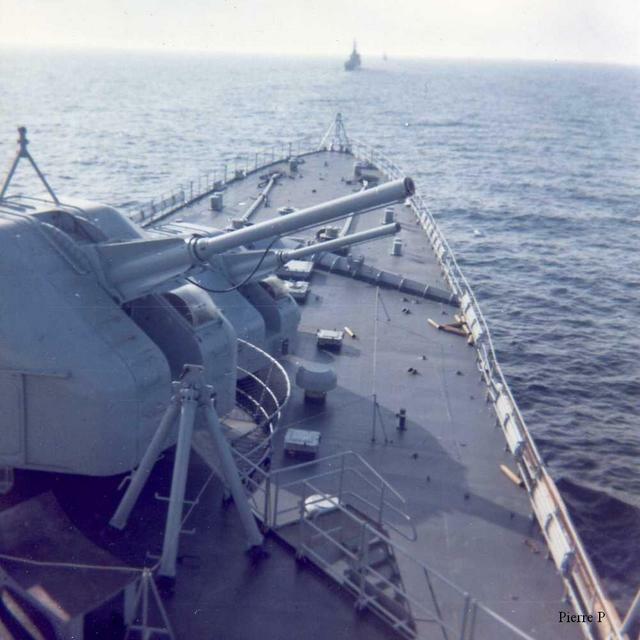 The ship was protected by a belt of armor of 100mm and the deck of 38-68mm. 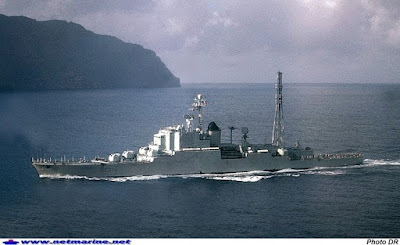 The electronic equipment of the ships consisted initially of one DRBV-22 air surveillance radar and one DRBV-11 combined surface/air search radar on the foremast and one DRBI-10B height finding radar on its pedestal abaft the funnel. 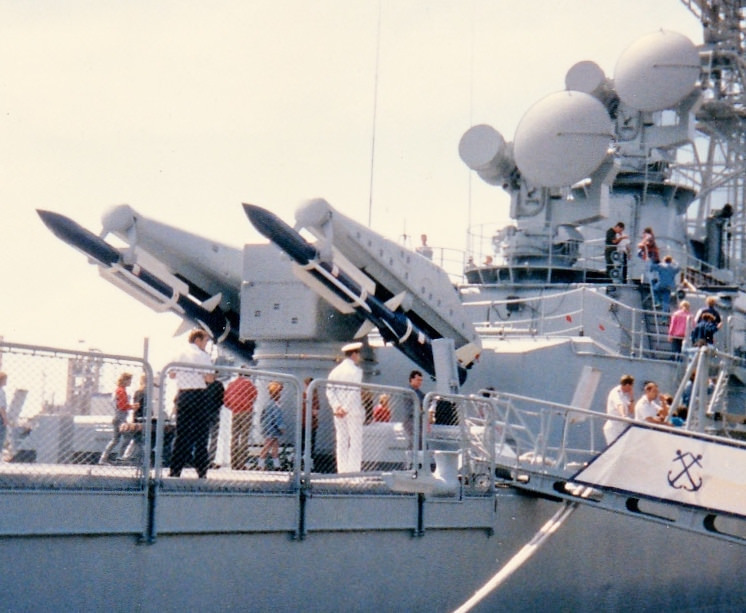 Behind the funnel was also a mast for the electronic support measures (ESM) and communication antennas. It should be mentioned here that the majority of the online sources report that the ships was commissioned with the DRBV-20 radar instead of the DRBV-11 which is not true as it can be seen clearly from the photos that the DRBV-20 was installed in the first modernization of the ship in 1961-2. Modified photo of De Grasse cruiser during the late '50s. For a high resolution image click here. In 1962, De Grasse followed a modernization program, where four of the ten 57mm mountings were removed (together with two fire control directors), as was noticed that topweight was too great. 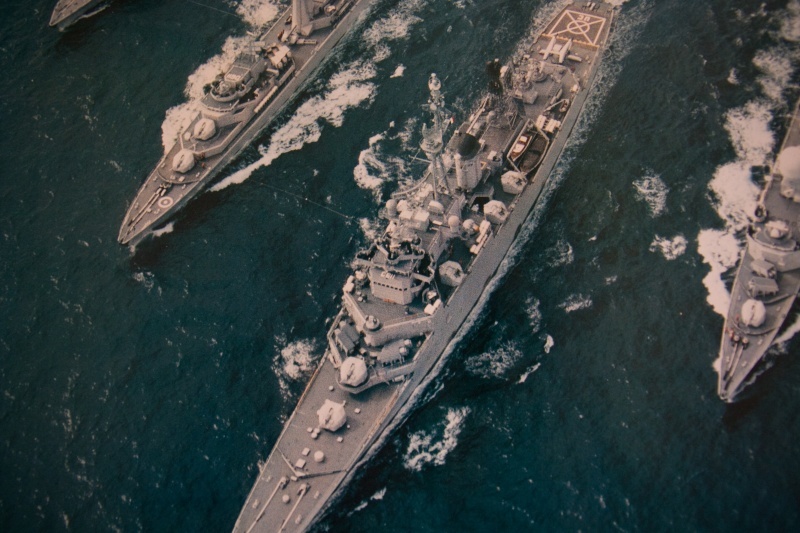 The removal of the mounts around the superstructure left space for enlarging the accommodation space. 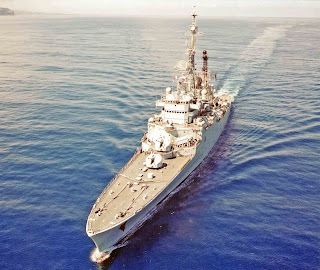 The ship was used as an anti-aircraft cruiser and flagship within the Mediterranean squadron, until she was selected to join the Pacific Experimentation Centre to participate in the first nuclear tests in French Polynesia. She undertook some modification in from May 1964 until February 1966, with the bridge being doubled, a 50 meters high quadripod mast mounted on the aft roof, a hangar was built and half the armament removed along with their fire control radars (only six dual 127 mounts remained). 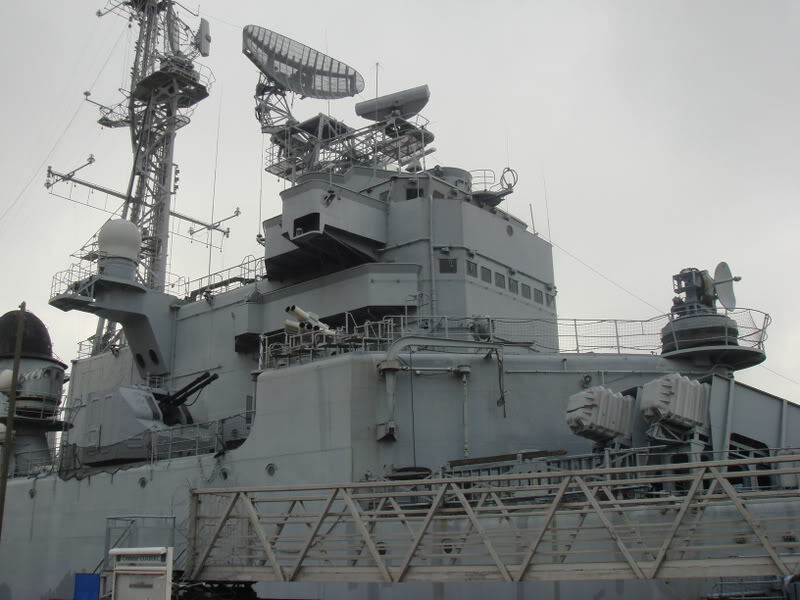 Furthermore, the DRBV-22 radar was replaced by the newer DRBV-23 and a TACAN was added on the foremast. The ship was also made gas-tight and fitted with washdown facilities. 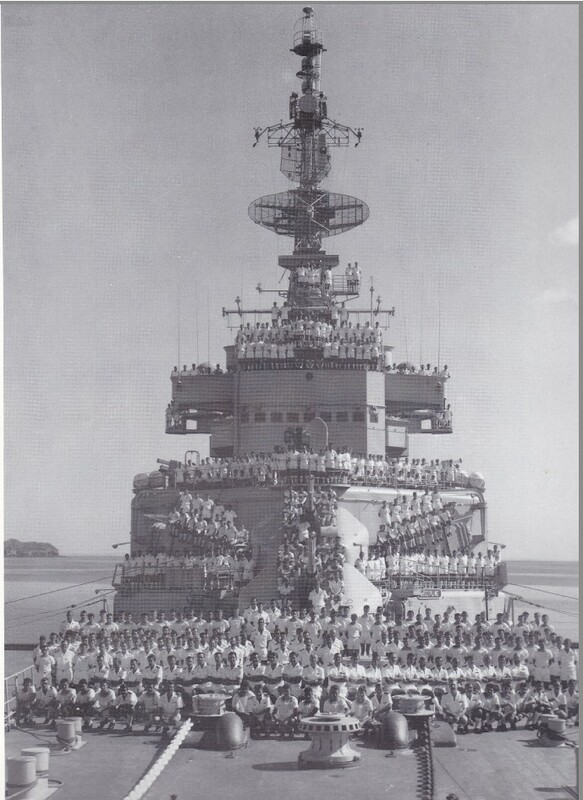 The equipment was modernized and the crew was downsized to 560 men, to make accommodation available for 160 engineers and technicians. 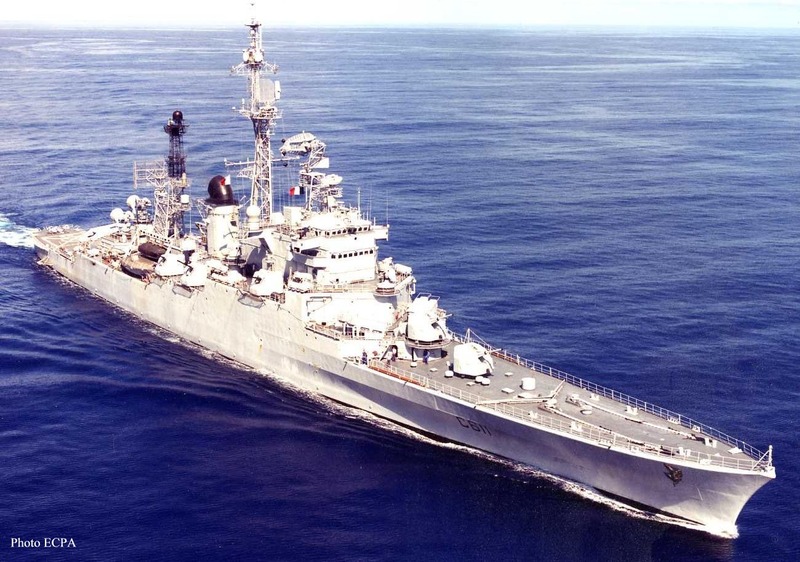 The ship was used for six testing campaigns between 1966 and 1972. 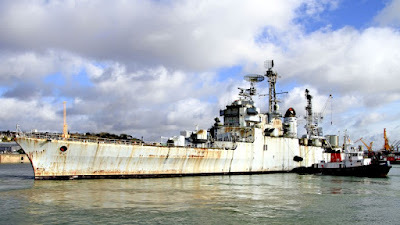 She was decommissioned in 1973 and was sold for scrap on 25 January 1974. 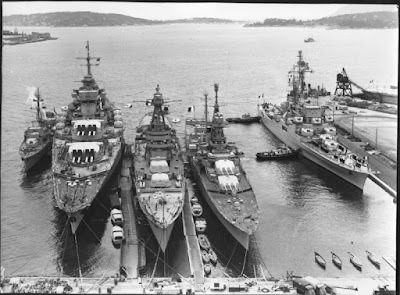 Scrapping took place in La Spezia (Italy) in 1975. 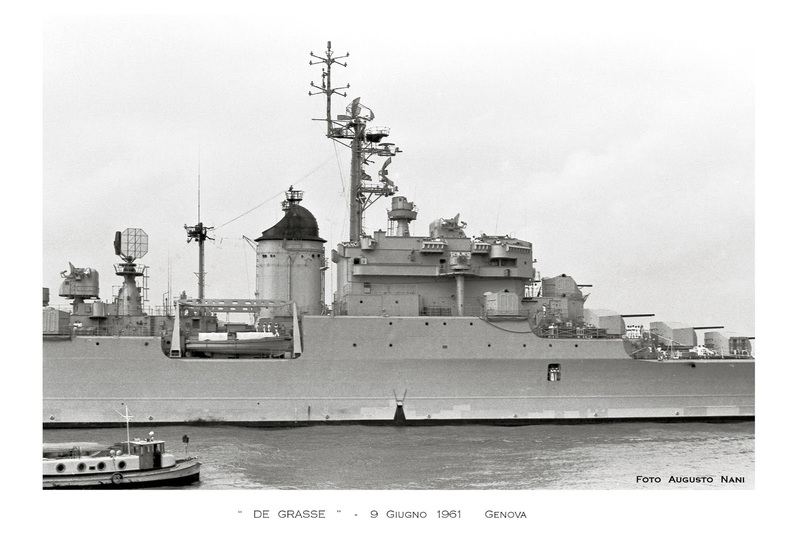 The De Grasse was decommissioned in 1973 after a quite short career, and was sold for scrap on 25 January 1974. The scrapping took place in La Spezia (Italy) in 1975. 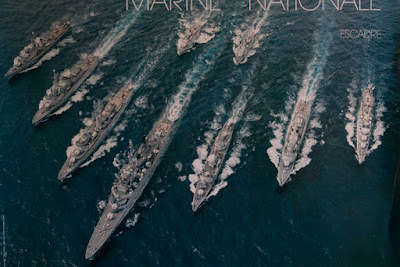 She was the last all-gun cruiser in the world. Τhe Colbert, was a completely new built. Her construction began in the Brest dockyards in 1953. 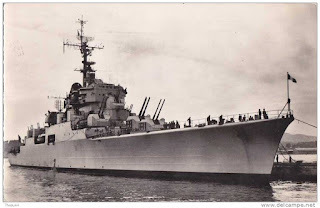 She was designed as a powerful ship, the second of the De Grasse series, able to overcome all threats solely by her guns' weight of fire - she had 57 mm and 127 mm turrets for a firing rate of one shot per second! 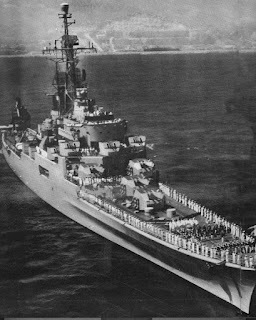 Launched on 24 March 1956 in Brest, France, starting her trials on 5 December 1957 and officially entering active service on 5 May 1959, she was made part of a 15-ship squadron, with the main aims of protecting aircraft carriers from air attack, shore bombardment for ground operations, command hub for naval operations and evacuating French expatriates from overseas. 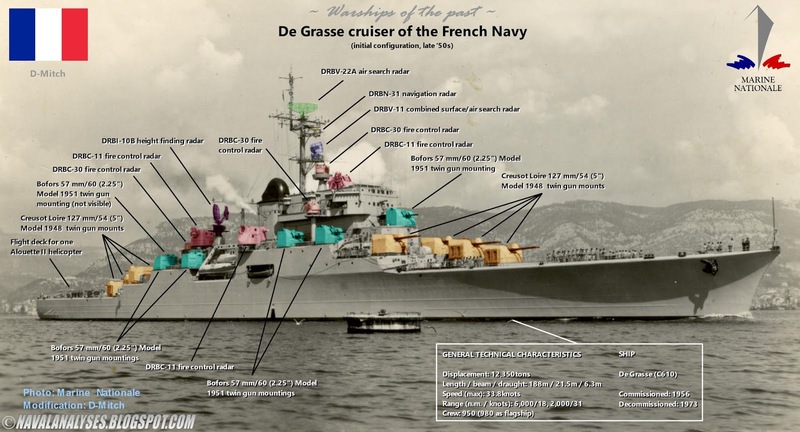 The Colbert incorporated a number of modifications in comparison with De Grasse, including a shortened transom stern, an increase in beam, a knuckle in the hull forward, and a new system of protection (80-50mm belt and 50mm deck). 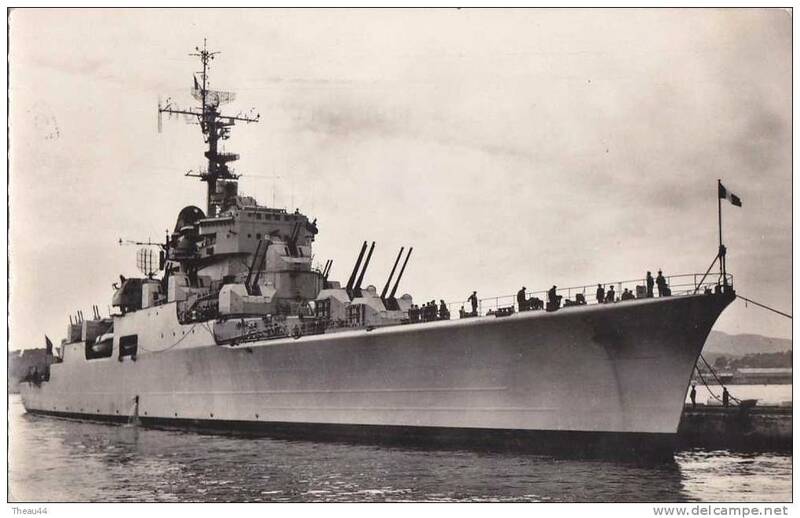 These changes appear to have improved stability, as Colbert retained her full designed armament until she was rebuilt in 1970. A reduction in installed horsepower was accompanied by the adoption of higher-pressure boilers, which contributed to a lower displacement. 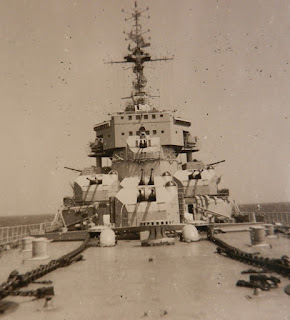 The funnel was moved further aft to clear the bridge structure, and a lattice mast was stepped immediately forward of it. 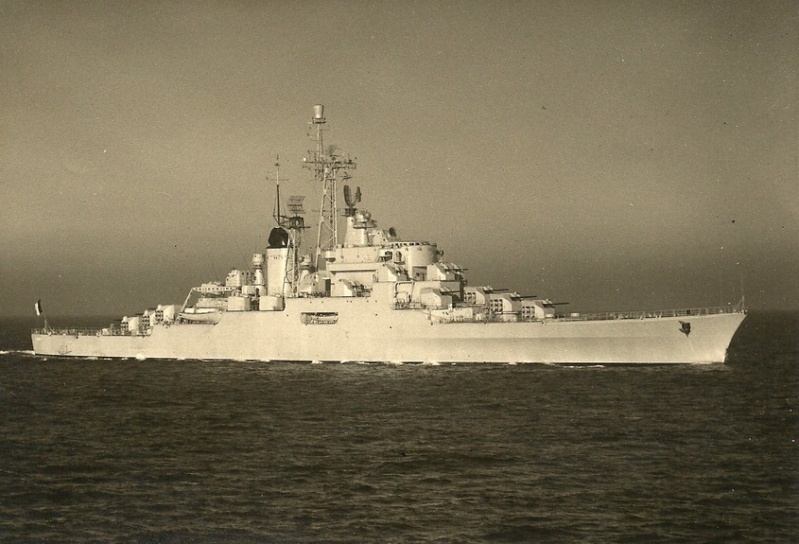 The silhouettes of the two cruisers were very similar with identical artillery in similar bun not identical layout (until 1962 for De Grasse), but the hull and machinery of Colbert differed from those of De Grasse, designed on the eve of World War II. The Colbert had a different superstructure and the funnel was located much further from the bridge while the lattice mast was immediately forward of it as it was already mentioned. 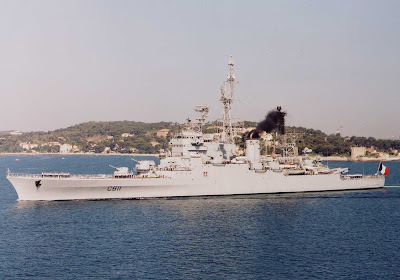 In 1964 a naval reorganization made her the flagship of France's Mediterranean squadron (escadre de Méditerranée) at Toulon, which was mainly made up of complementary units such as aircraft-carriers and frigates. The Colbert could, as fast transport, boarding (for a short time) a force (land) intervention of 2400 men. Her role as a foreign representative of France was important. 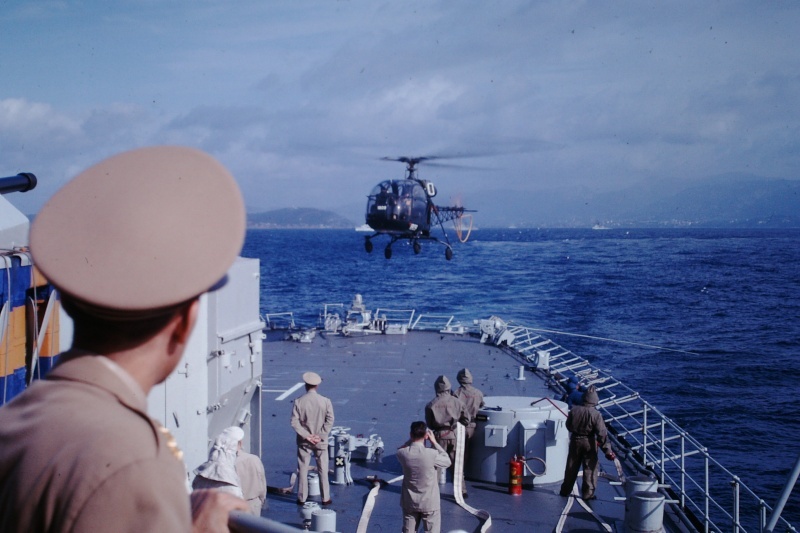 In 1961 she repatriated the remains of Marshal Hubert Lyautey and she ferried General De Gaulle both on his 1964 South American tour and on his June–July 1967 official visit to Canada. 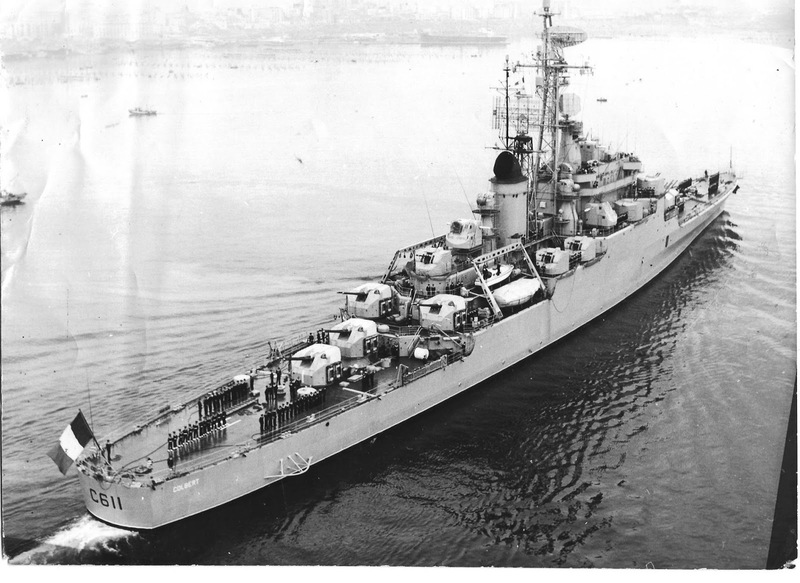 Nicknamed the “floating Elysée”, the cruiser Colbert (C611) was the official maritime transport of General Charles de Gaulle! Colbert also represented France at the bicentennial festivities in Australia in 1988. 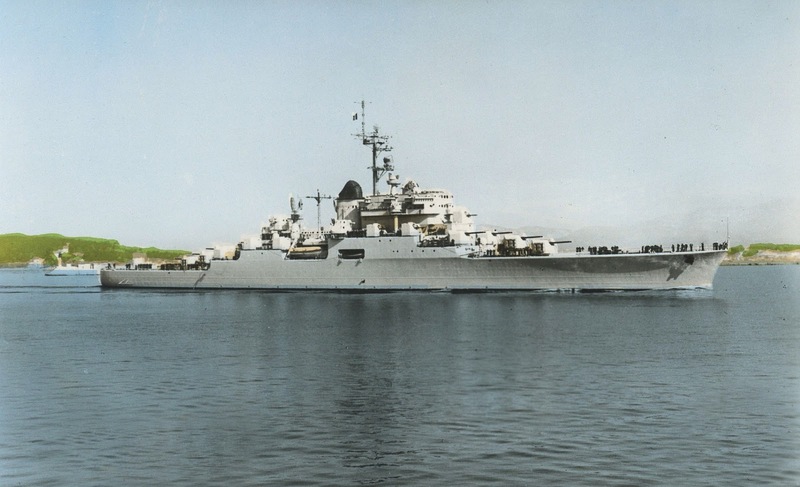 Built too late, after the cruiser's time as the main arbiter of naval warfare had passed, Colbert was superseded at the end of the 1960s by a new generation of ships better adapted to new threats. Her big-gun-based armament had become obsolete and inefficient against supersonic attack aircraft and thus a decision was taken in 1969 to upgrade the ship with modern armament and electronic equipment in order to be able to continue keeping the role of the flagship and to overcome successfully the future threats. Modified photo of Colbert cruiser during the early '60s. For a high resolution image click here. 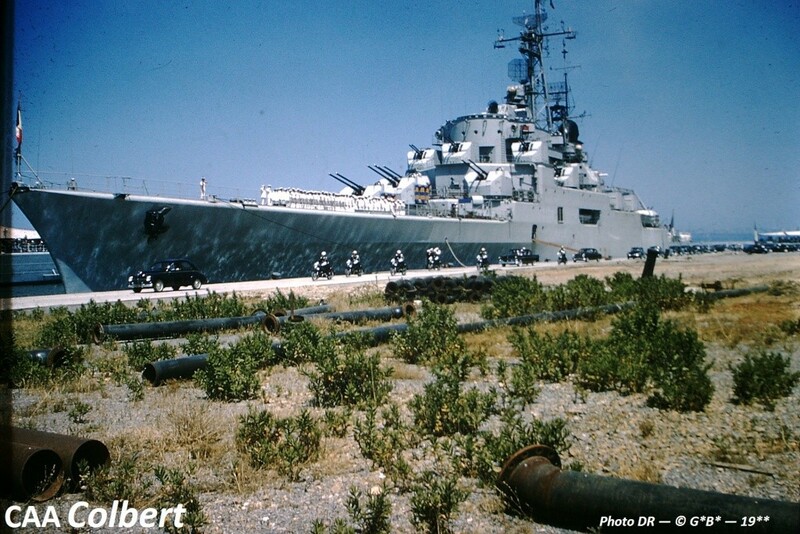 Between 1970 and 1972, Colbert underwent extensive modifications in Brest to become a missile cruiser, with a double ramp of Masurca surface-to-air missiles and the new that time 100mm guns. 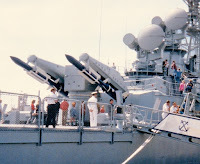 The initial plan was to equip the ship with six 100mm mounts, six Exocet launchers and a hull sonar but due to budgetary reasons the guns were reduced to two, the launchers were installed much later in 1982 (only four) while the sonar was never installed. The modernization was also less extensive in relation to the electronic equipment. In 1982, Colbert received the Syracuse satellite communications system; she was the first French warship that was equipped with this SATCOM system. 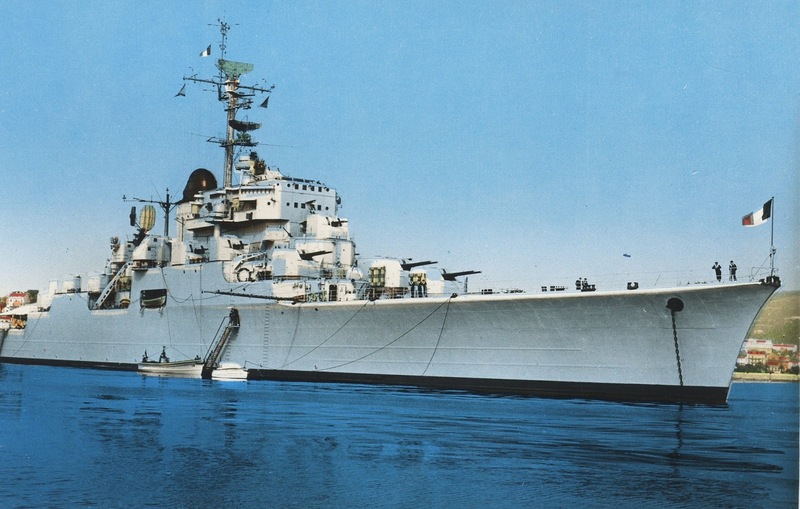 She once again became flagship for the Mediterranean squadron from 1976, but her duties from then on were mainly humanitarian or representative - Agadir in 1960 and the evacuation of Bizerte in 1961. She gained a reputation within the French Navy as a ship that had never fired a single shot in anger, with her only ever active service being in the 1991 Gulf War (operation "Salamandre") a few months before she was decommissioned on 24 May that year. 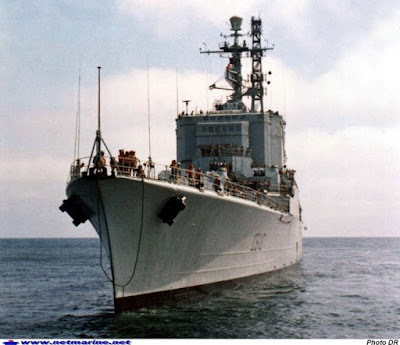 Initially it was planned that the cruiser would have remained in service until 1997, but due to the high requirements for crew and fuel led to its withdrawal from service. Click to enlarge and save the image to view the details: modified photo of Colbert cruiser during the early '80s. For a high resolution image click here. 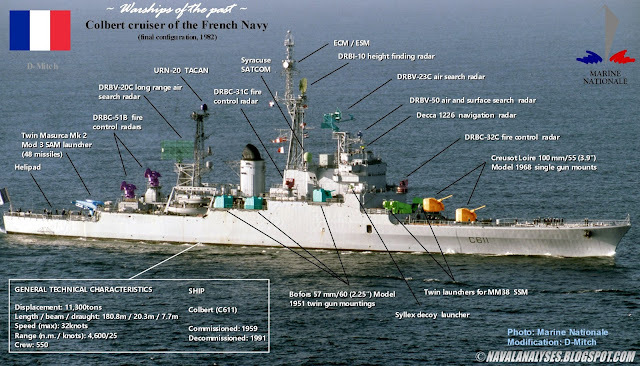 Between June 1993 and 2007, she was a museum and monument historique in the port of Bordeaux. During 2004 she was France's most-visited museum ship and the city's most-visited historic attraction. She was a private museum, belonging to the state but with the museum's running handed over to "The Friends of the Colbert" association. A visit lasted between 2 and 3 hours, with guided visits given access to parts of the ship closed off to the public, such as the engine rooms and cabins. The ship also housed several permanent exhibitions on the Navy, Météo-France and architectural models (in which one could see modellers at work). The ship's siren went off at midday every Wednesday and Sunday. A covered restaurant and dance-room was built on her foredeck, served by the ship's former kitchens. A "Colbert" stop on the quay by the ship was even planned on the city's tramway, allowing faster access to or from the city centre and thus increase visitor numbers, whilst the ship's presence led to the quays becoming highly developed. She was towed on 31 May 2007 (the date that the concession to the "Friends" ran out) to join the mothball fleet in Landevennec (some photos of the ship here and here, including her interior). 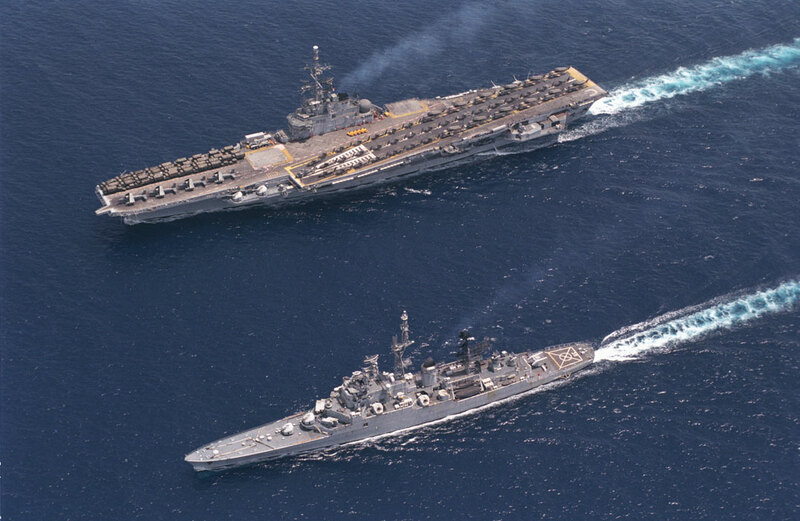 Due to major technological similarities, the Navy cannibalized parts from her from time to time (mainly from the boilers and turbines) to maintain the helicopter-carrier Jeanne d'Arc, with the decommissioning of Jeanne d'Arc in September 2010 Colbert was free to be dismantled. 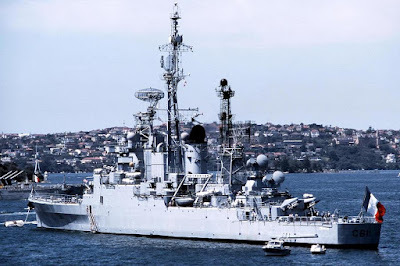 On February 2, 2016, French Navy cruiser Colbert, the last of the long line of French cruisers, was towed from Landévennec maritime cemetery to port of Brest to be prepared for the last voyage and scraping at Bordeaux/Bassens. 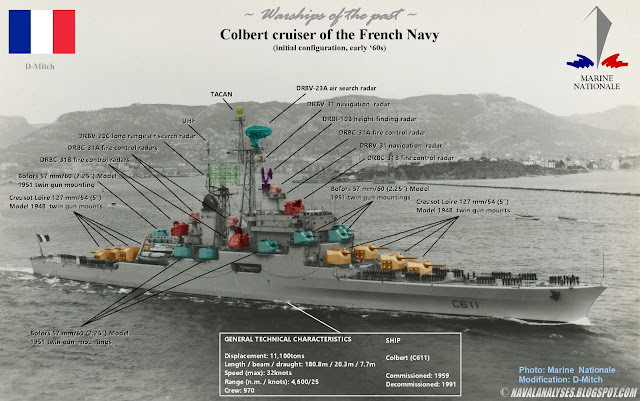 The Colbert, was one of the largest surface combatants of France for decades (and the largest one for 20 years approximately) and the last anti-aircraft cruiser of the French Navy. 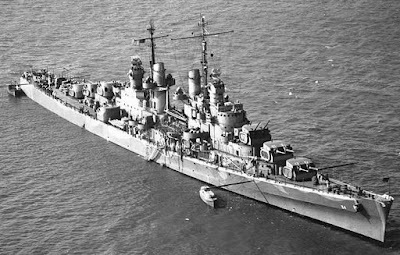 The Jeanne d'Arc remains the last French cruiser although she never had this pure role neither could act as a flagship or had such powerful armament as Colbert. 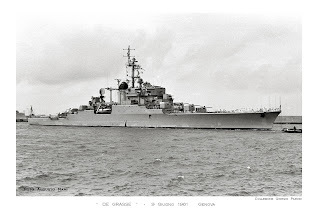 It would be interesting to no more about the actual performance and reliablity of the 127mm ( 5 inch approx) twin 5 inch turrets used in the De Grasse and Colbert. 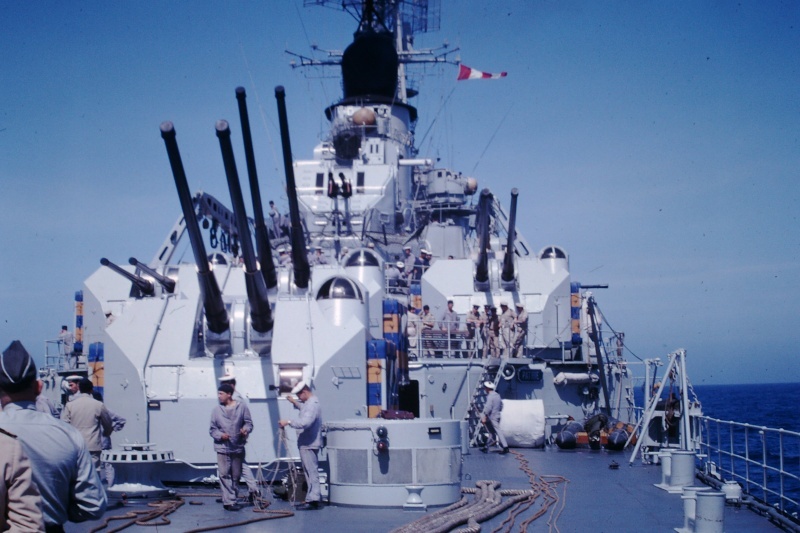 The guns are essentially long 70 calibre versions of the standard USN WW2 type twin 5 inch turrets which were sometimes power rammed and continued in use at least until the final USN Fram 2 Gearings were withdrawn in the 1980s and also on the reactivated Iowa battleships. 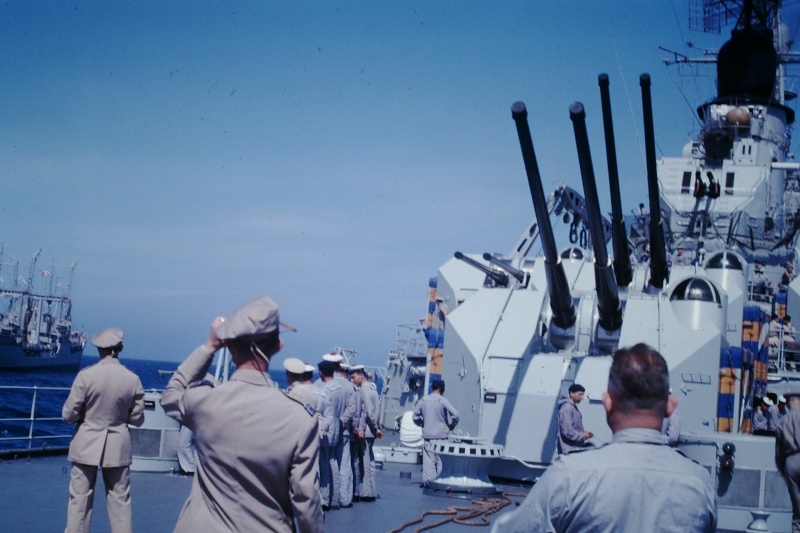 However these 70 calibre guns appear to have been used briefly only on in the USN on the Midway carriers and were disliked because of the shell weight in handloading and the French version uses a different turrent with significant difference. 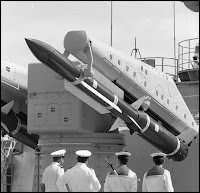 Remarkably little is also known about the actual perfomance of the power rammed version of the Rn 5.25s futted to HMS Vanguard and I suspect they were rarely fired after the battleships initial trials in 1946 because the ship was so overweight and only starshells may ever been fired from them after 1947. 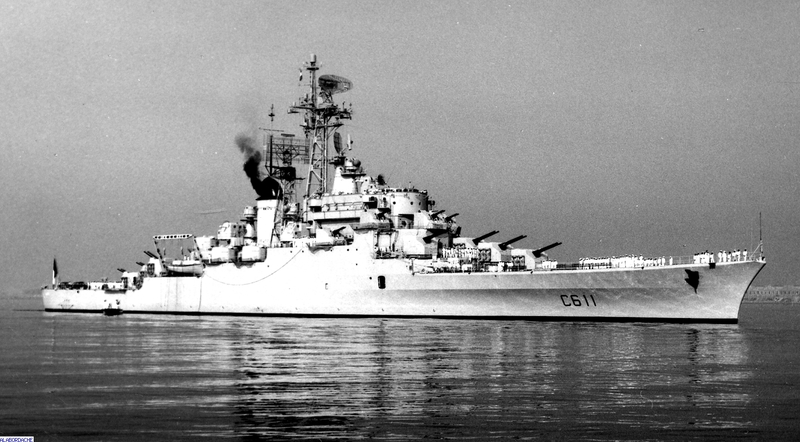 The actual performance of the Vickers single auto 4 inch on the Chilean destroyers supplied in 1961 as like the earlier destroyers supplied to Venuezula these are prototype cruiser destroyer designs built with the intention that they would be aquired by the RN had a near or actual hotwar situatio developed in 1955-1960. It is obvious that the 4 inch guns would have been extensively tested by the Vickers/ RN engineers in 1960 in trials and I wonder how much consideration was given to using them on the County DDG, the weight of the Vickers 4 inch shell is about the same as the Mk 6 twin 3/70 on the Tigers 33lb and its effective surface range is not clear being quoted as anything from7.5/12 miles.